The Merry Crab Beach Lodge - Glenmore Beach Accommodation. A Secure and secluded beach bush resort, "The Merry Crab" is carved out of the Indian Ocean's lush, tropical Admiralty Reserve and is only a pathway away from a beach so pretty, film-makers have used it for movie sets! The poolside lapa is a popular rendezvous where guests gather to discuss "The biggest wave", "The one that got away" or the "The almost hole in one"! The Merry Crab's 1 & 2 bed roomed units can accommodate up to 40 guests. Fresh linen (including bath towels) is supplied. Each cabana has its own fully equipped kitchen (stove, microwave, fridge), DStv and built-in braai. Inside large paddle fans lazily stir the air while a faint sea breeze is always apparent on the sun-decks. Secure parking is provided. The Merry Crab is 10 minutes north of the Wild Coast Casino, 15 minutes south of the Margate Airport and 2 hours from the new King Shaka International Airport, Durban. Restaurants: all within 5 to 10 minute drive. 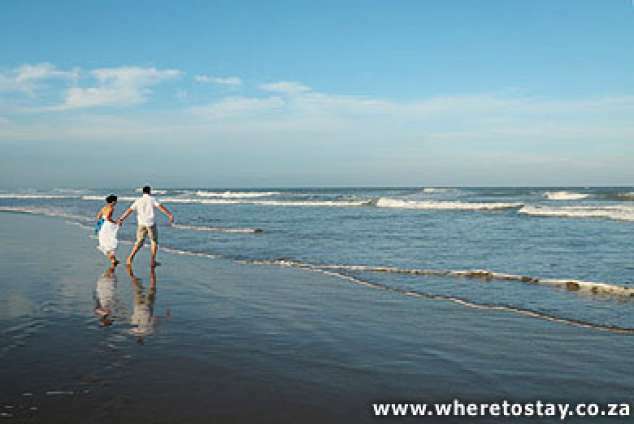 Munster is 10 minutes north of the Wild Coast Casino, 15 minutes south of the Margate Airport and 80 minutes south of the Durban International Airport. 75673 page views since 23 Apr, 2003.